Toys will be broken. Dreams will rise. 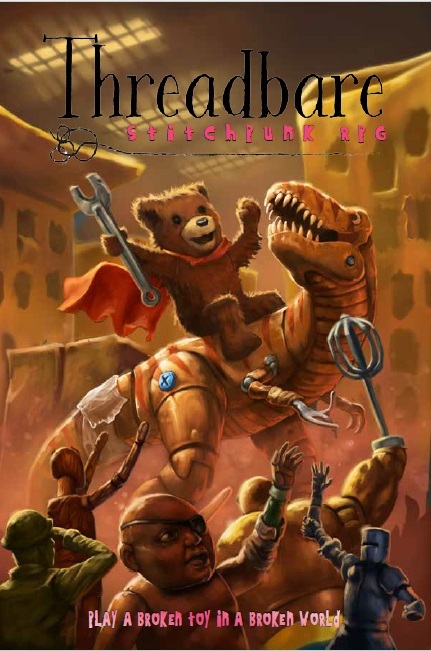 Buy Threadbare now on DriveThruRPG and IPR! Did you buy Threadbare at a retailer? Check out the Bits and Mortar program, and get your PDF copy, too! With careful stitches and meticulous work, a ragdoll carefully sews back a torn limb on a panda who is crying out his troubles (girl troubles… isn’t it always a girl?) while he sips from a daintily painted teacup filled with brandy. In another room in the shoebox house she calls home, the ragdoll’s other patients wait patiently for her craft. A Mekka bulldozer, metal with chipping yellow paint, is missing his front left wheel. He holds a vinyl doll’s head, waiting for it to be glued into the empty wheel well. It won’t roll quite the same, he knows, but he can live with the handicap until he scavenges a better part. That’s not what has him worried. If he’s particularly unlucky, this doll’s head may still have a part of her personality infusing it. Will he face a battle of wills between his own, stolid work ethic and the whining of a baby doll? The murderous rage of a cast-off Barbie? Will he develop an eccentricity while their personalities merge and one asserts its dominance over the other? The ragdoll finishes with her panda patient and wishes him a cheery farewell, tucking his payment (2 buttons and a tiny watch gear) into her skirt pocket. She quickly schools her face to hide her sly, greedy smile when she steps across the threshold to the waiting bulldozer. His repair is going to need glue, and glue is a costly resource, my friend…. The rules mechanics are based on the Apocalypse World engine: you roll 2d6’s and add your modifiers to determine the direction your story will go. As you progress in Threadbare, your character changes. Every time you are damaged and repaired, you change your description and even your personality! Threadbare is a game about making and repairing stuff, and less about killing things. Combat is rare and resolves quickly without use of dice. Stitchpunk is a loose term for a modge-podge aesthetic of stitching and fabrication that is exemplified in the excellent movie 9. It shares qualities with steampunk, but has a more sewn-together, hacker-space feel. Stephanie Bryant is a 40-something writer, knitter, and gamer. She has written adventures and supplements for Epyllion, TimeWatch, The Baby Bestiary vol 2, and the Night’s Black Agents Edom Files. An avid role player since childhood, she has made RPGs a central part of her hobby life for over 30 years. Stephanie also wrote and published Handknit Heroes, the first superhero comic book for knitters. Eric Quigley is a 30-year-old freelance illustrator in the G+ indie pen and paper industry for the past four-ish years. Originally a graduate of VCU’s Communication Arts (Illustration) department he moved around for a while before settling in Portland, Oregon where he has resided for the past two years. While always a fantasy nerd at heart he has begun working in a variety of genres, even getting into children’s illustration on the occasion. Eric’s clients include the likes of the Monte Cook Games, Evil Hat Productions, and the Alderac Entertainment group as well as many other smaller indie studios. Josh T. Jordan is the designer of Heroine, The Sky Is Gray, and You Are Distressed, and other games. He is also a Global Coordinator for Game Chef and a high school teacher. Alex Roberts is a writer, podcaster, and roleplayer of boundless enthusiasm. Bryanna Hitchcock loves roleplaying games, playing music, her wife, and her cat, but not necessarily in that order. She is very lucky to have many sweet, creative friends in her life. Liz Chaipraditkul is a game developer and writer who lives in the Netherlands. She owns Angry Hamster Publishing – a tabletop role play company and writes articles for her own personal blog on gaming. Liz’s first solo game WITCH: Fated Souls, was successfully funded on Kickstarter in 2015. When not in her own imaginary world, Liz keeps busy with crafting and walking her dog. You can follow her developer exploits @angryhamsterrpg or on her website. Brian Dirk never grew up, his toys just got more powerful, creepy, and unique. His alter-ego is a mild-mannered Network Guru by day, and a Maker, Artist, Storyteller, and general weirdo: also by day. He forgets what he does at night. Elsa Sjunneson-Henry is an author and disability advocate living in New Jersey. She’s the creator of DEAD SCARE and The Fate Accessibility Toolkit, and has written for numerous tabletop RPG’s. When she’s not busy attending games conferences as either a speaker or a disability access coordinator, she’s walking the streets of Hell’s Kitchen with a white cane in hand.